The amount of flexibility in the modern recording studio is nothing short of mind blowing. Although most engineers probably don’t welcome the phrase “we can fix it in the mix”, many will take full advantage of the tools at hand to make improvements after tracking when they are called for. 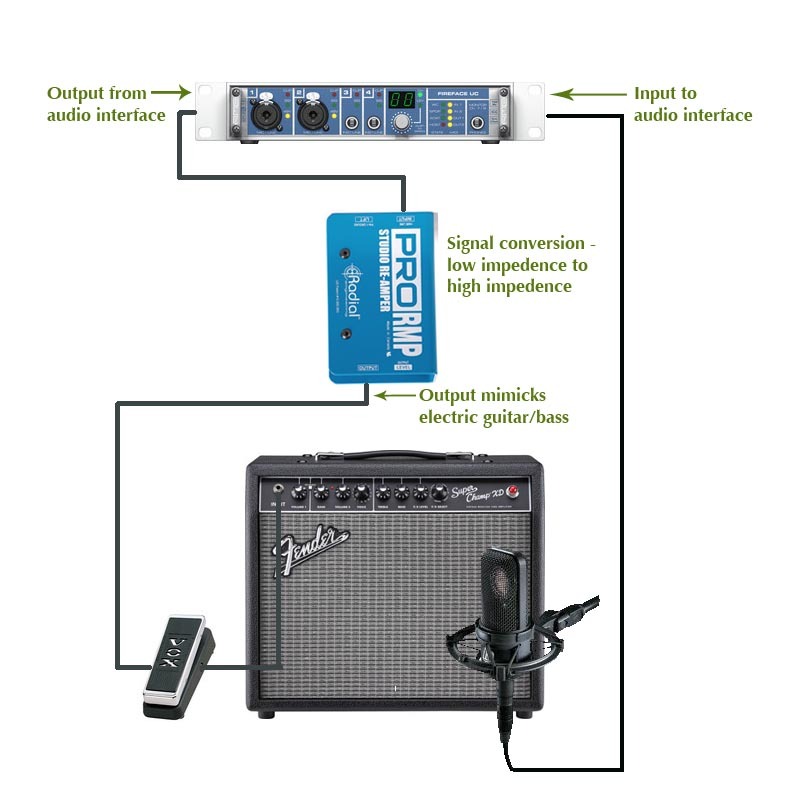 One great way to improve the sound of a guitar or bass track or just to switch it up is by re-amping it. The concept is dead simple; take a recorded track in your project, play it back through a new signal chain and re-record the results onto a new track. The idea is not new, but re-amp devices made today are specially designed to convert the low impedance signal from your audio interface to a high impedance signal needed for properly interfacing with electric guitar or bass through effects pedals and amps. This is most effective when you start with a clean track. For that reason, I like to record a separate clean output track from the DI so that it can later be re-amped if desired. Here’s how it works. On a recent recording date we recorded the bass direct through a DI and were satisfied with the sound. But when mixing we found that there just wasn’t enough to fill out the lower end of the mix. It was missing something. We tried different EQ and compression settings and virtual amps but they weren’t really doing the trick. We wanted to get some of that “pump” that happens when air is being pushed from a speaker and captured with a microphone. Re-amping was the answer. The direct track was played back through a Radial RMP-Pro re-amper into a Markbass CMD 121P bass amp and we used an AKG D112 microphone to record the amp. Sometimes going direct only with the bass is sufficient. In this case we were wishing that we had also captured the sound of a bass cabinet with a microphone. Luckily we were able to do just that by re-amping. Another scenario might be if a guitarist decides later that he or she isn’t pleased with the sound that was captured from the amp on the original takes. No problem, it can be replaced. Maybe they would like to double the track with a slightly different amp sound. Or maybe there was a rattle or buzz in the guitar track that went undetected on the original recording. This can easily be remedied by re-amping. This entry was posted in audio, Mixing, Recording, Studio and tagged re-amp. Bookmark the permalink.